Batanagar Education and Research Trust (BERT) was initiated by a group of high level working professionals and eminent academicians in order to spread quality education in Engineering, Management and Science. 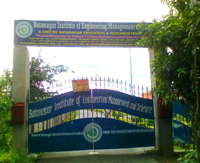 BERT thus played a prominent role to launch Batanagar Institute of Engineering, Management and Science (BIEMS) in 2012 with AICTE approval and affiliation of West Bengal University of Technology. The ultimate goal of BIEMS is to develop the institute as Centre of Excellence for technical, science and management education. The institute has given maximum stress on modern teaching methodologies, faculty development, promotion of research activities so that the students graduating from the institute are industry-ready professionals with leadership values and high degree of professional skills.